The primary parameter of jumper cords is a gauge. The less the gauge is, the thicker is the cable delivering amps faster to the stranded battery. This gear won’t melt at the hot engine work or a powerful current, and stay flexible even at the cold temperature, unlike the cheaper (and thinner) ones. At the same time, thick low-gauge cables take more space in your emergency kit than higher-gauge ones. 1 gauge — the thickest and most powerful cord passing 800 Amps at a time. A must-have for SUV, trucks, and other heavy-duty vehicles. They are cold-proof and reliable. However, quite costly, large, and heavy. 2 gauge — a perfect option for the future-proof investment. Its cost is a bit more than 4 gauge jumper cables. 4 gauge — the best bang for the buck. For those who need a high-quality reliable product for less price. 6 gauge — nice middle-class option, however, not recommended to use in the cold temperature. 8 gauge — an acceptable budget-saving option for the small cars. Not for cold climate areas. 10 gauge — thin and cheap jumper cables passing very low amps. Not for heavy-duty use. Here’s the list of the gear that stands for the best jumper cables by some of the parameters while giving in by other ones. The 10 gauge cables aren’t on the list as they power the battery too slowly and get stiff at cold temperature. These heavy duty jumper cables transmit huge power immediately — up to 800 Amps. It means SUV, heavy truck, boat, or even bus can be started within seconds. Each truck jumper cable has 25 ft length, which spares the drivers the pain of aligning the cars hood-to-hood. These 1 gauge jumper cables allow no warmth during operation. They are not subject to tangling, too. 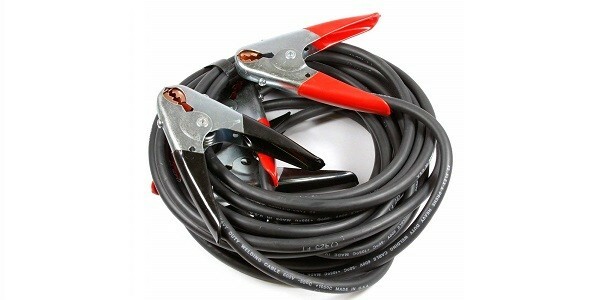 These long jumper cables have insulation over the entire wire and clamps, not exposing an inch of metal to the touch. The rubber plastic coverage also protects the metal parts from rust. 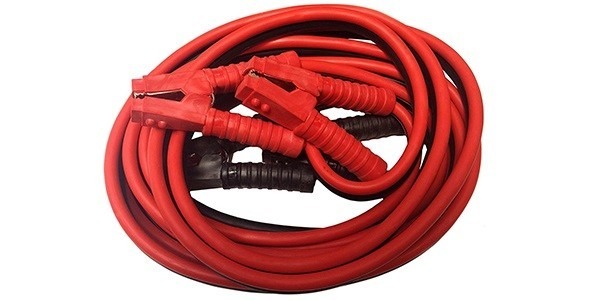 For the genuine heavy duty work and the next-to-budget price, this set of jumper cords could be called the best jumper cables ever. Still, the copper-and-aluminum build makes it lose the score. The speed of current transmission, though, is very impressive. It´s perfect for charging the large flat power banks. The wire and clamps are colored according to their polarity for faster and comprehensive connection. Handy rubber-striped clamp hands ensure a tight grip. The clamps jaws are not big and might not fit some big battery posts. Insulation gets corrupted at low temperature. The biggest advantage of this booster cable is its 100% copper build allowing it to pass through mighty 800 Amps within a fraction of a second. It makes them stand out among the best jumper cables as the fastest performer. However, the solid wire ends up with the steel clamps and jaws only having a thin copper thread to them to conduct the current through. Thus, the huge capacity of these long jumper cables is limited by the poor passthrough at the ends. Still, the heavy duty 1 gauge design delivers the current really well and without issues even at the extreme working parameters of the jumping source. There’s no problem cranking any kind of truck or heavy SUV with it. The 25 ft length brings flexibility for the positioning of the source and the recipient car. The cords are temperature-proof as they show equally good performance in the heat and freezing cold, not even warming up the insulation. Enhanced build of the jaws providing for strong hold. Fully insulated hands and hand-to-wire connection protects the user from current exposure. Solid and comfortable storage case. The cords are joined in the middle part and are not handy to connect one by one. Thick and easily bent wire that doesn’t go stiff even at zero temperature. It is a great backup option at any season. This unit delivers the amps steadily at any temperature and would deserve the title of the best jumper cable in its category, save for the quality of its material (not pure copper). 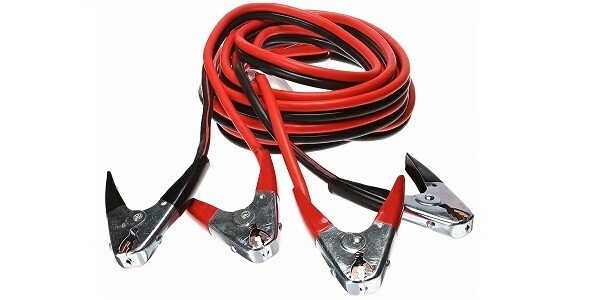 These battery jumper cables represent the copper-clad aluminum cords and clamps, both being large in size and heavy. Still, they do allow cranking a powerful 3L diesel engine in no time and not requiring any revving of the source engine. The cords are 25 feet long; so, there is no problem choosing for the suitable position of the vehicles for jump starting. 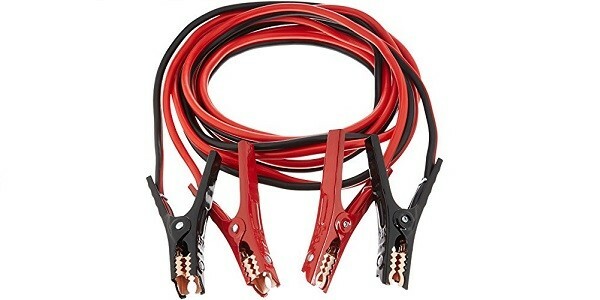 Overall, these cheap jumper cables ensure steady performance and feel very durable, not letting even a tint of warmth at the most intense operation. Large jaw opening allows for the good grip in the most unhandy battery positions. Solid wire-to-clamp connection is placed inside the clamp and thus eliminates cable bending and wearing out. Extra bonuses of the storage case and operating glove. The working part of the clamps is not insulated providing for the shock and short circuit hazard. Fitting the wire into the case takes effort and skill. 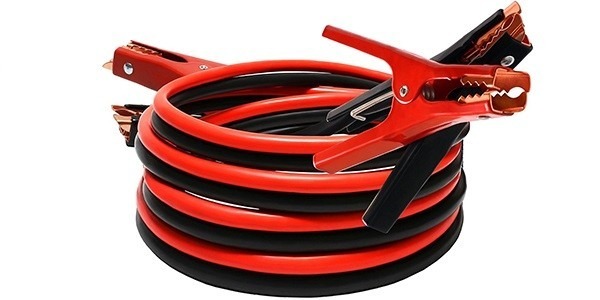 This solid set of full 2 gauge jumper cables and large-jawed clamps would be rated as the best car jumper cables but for its high price. The latter, however, is justified by the pure copper making the body of each cord and delivering the 500 Amps constant flow. This gear will jump start most of the cars including the large SUVs and some trucks and even tractors, and is applicable for the boats and other middle-range crafts, too. The clamps are made of steel but have the same passthrough capacity as the cords allowing for the fast and efficient jumping of the stranded vehicle. They are middle-sized and handy to use while feeling really strong and grippy. The booster cables are cold-proof and do not lose the capacity with the temperature going down. They are heavily insulated and do not pass heat while operating. Full 25 feet length of the jumper cords is enough for the considerable operational space and vehicles’ positioning options. The 600V potential allows using the cables for the full range of jumping purposes and types of sources. The cords tend to tangle. Same coloring of the wire might be misleading while establishing the proper connection between the batteries. Being thick and future-proof, this heavy duty jumper cable feature extreme flexibility that turns very helpful in the complicated parking situations. Having a car nose in or battery-side close to the barrier might be an issue even with the long jumper cable. However, the Cal-Hawk CBC25 can be bent and laid closely along the curves, thus, reaching the battery posts perfectly. The chilly weather is not an obstacle for these cable — it delivers a constant flow of the powerful 600 Amps’ current, cranking any gas engine within seconds. Still, the large diesel motors might need more time and accelerating effort to wind up. The different position and location of the battery posts (on top or aside of the power bank) can be handled easily with these car and truck jumper cable that run for 25 feet on end. Sturdy parrot clamps with heavy and grippy jaws. Solid and flexible protective insulation on the cords. Non-tangling wire design provides for comfortable operation and storage. The clamps are not fully covered with the insulation providing for possible current shock. No supplements, such as the storage case. The price tag for this set of the reliable 2 gauge jumper cable is able to satisfy the most modest budget. Meanwhile, the quality is not to spare. The booster cords are thick solid aluminum covered with a layer of copper urging 600 Amps through. 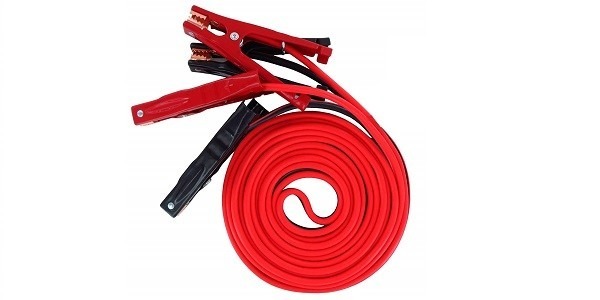 The jumping cords can easily convey the energy to the stranded battery and turn on the engine of the middle-sized trucks and SUVs, as well as lighter vehicles. The cable runs for 20 feet long solving efficiently most of the emergency jumping situations. The wire is connected securely to the massive clamps that have full insulation coverage not leaving the slightest chance for the current to escape the cable’s system. The cords and connection clips are covered with the temperature-resistant TPR material (a green material not polluting the ecology and safe to use). The patented construction of the clamp connects featuring the additional inside tongue for better linking to the power bank. The diameter and material of the cord and its coverage allow it to pass through the amps and stay flexible at below zero temperature. The cables come with extra bonuses of the current-resistant glove and maintenance brush. The clamps are clad with copper only partly – at jaws area. The complimentary storage bag is too light and thin to sustain the frequent use. 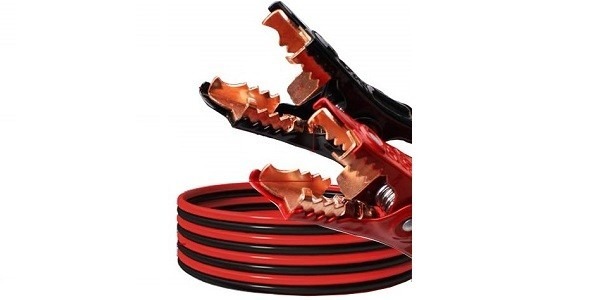 The sturdy alligator clamps are the main highlight of this battery jumper cable. They are strongly built but slim fitting into the tiny space between the battery posts and other under-the-hood stuff. The jaws open widely and have an additional metal tongue inside ensuring better conductivity. They might peel off some of the battery post paint due to their strong bite. Overall, the cable represent a solid middle class product. It is made of copper-coated aluminum; yet, can pass through enough amps to crank a regular SUV or a garden tractor. Though the minutes might be required to turn on larger vehicles, these booster cables would not fail even at extremely low temperature. The current goes quickly through the set to the battery, while the cords remain flexible if slightly warming up at the extreme load. For the next-to-budget price, these cables are sold with the aiding kit of the wiping brush and electricity-proof glove. Solid eco-friendly insulation covering the cables and clamps full (exposing only the inner part of the jaws). The 20 ft length of the cable doesn’t affect its operation while providing for different options of vehicles’ positioning. Doesn’t fit for regular heavy duty usage. The complimentary brush for corrosion removal has too soft bristles that quickly entangle and get worn out. A thick heavy coating of this cable adds to its weight making it heavier than analogs. The strands themselves are too thin and are not pure copper but the copper-covered aluminum. Thus, the conductivity is less efficient than in the all-copper 4 gauge wire. In the meantime, these jump starting cords can handle up to 500 Amps simultaneously, which is quite enough for light pickup trucks. As to the regular passenger car, these booster cables crank it within a moment. A thick coating provides for the issue-free usage in the regular range of temperature of the continental climate. The starting cables are 20 feet long, ensuring the wide operational area and various positions of the vehicles. The clamps are wide-mouthed alligators featuring a little extension of the jaw on end. Thanks to that, they are easy to install at the battery terminal and hold on to it confidently. The cords stay cold even when working at extreme load. Solid clamp-to-cable connection ensures safety and reliability. Anti-tangling design helps keep the jumping cables in order and ready to use. The handles of the clamps are a bit short and require effort to unclench them. Fitting the wire into the travel bag is not too easy – one must fold them in a certain way. These long jumper cables run for full 20 feet allowing it to implement almost any scheme of the vehicles parked. The cables are thick enough to convey 400 Amps at a time and can deal with all types of motorcycles and regular cars. Still, even a pickup or a boat is not a tough issue for this set of jumper cords, though some time might pass before the engine revs on. The clamps are sturdy and massive, ensuring good grip and hold. The jaws design features three independent teeth on each jaw biting the battery post from different sides and securing it confidently. The clamps and cables have the same color enabling the easy installation even by the inexperienced user. The anti-tangling design provides for the unit’ readiness at any time of emergency. Besides, the comprehensive jump starting manual attached will assist in building strong and safe connection. Can work efficiently at extreme temperatures and weather conditions. Solid all-cover insulation runs over all the details that are not designed to provide electrical connection. Thick enough to handle the 400 Amps transmission without getting hot. Heavy weight with regard to the average weight of 4 gauge copper-aluminum cables. Wrapping the jumper cables into the storage bag takes considerable time. The budget price of this set of jumper cables makes them a lucrative offer to buy and calm down the safety scruples. 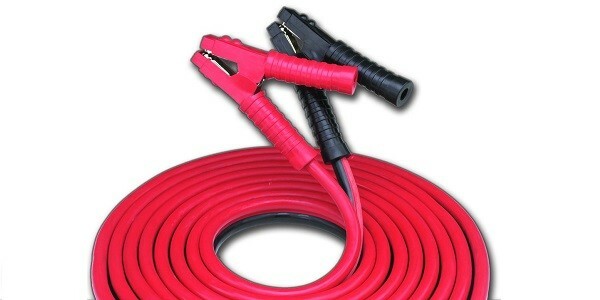 These cords fit into the tiny spaces and do not entangle due to specific rubber coating design. However, handy placement is not their single advantage. The aluminum wire covered with a layer of copper delivers amps confidently and constantly letting the car, the motorcycle or a small truck with the flat battery to revive. The smart T-prene coverage keeps the cables tangle-free, while securing the user from the contact with metal parts. It allows the cords to stay flexible at a low temperature and resist the impact of water, mud, chemicals, etc. For the beginner drivers, the leaflet with jump starting instructions is attached to the cables on a permanent basis. The kit also includes the gloves to keep the hands clean while working with the cables and the battery. Ergonomic shape of the clamps ensures the strong bite on battery terminals and comfortable hand grip. 16 feet length takes small trunk space but allows boosting the engine at the sequential parking. Easy-to-fit carrying bag with a puller is great for quickly packing and storing of the wire. Get warm when connected to the high-power source. Due to the extended front part of the jaw, the clamps might not fit the small side battery posts. The thin wire of this set of car boosting cables is made of copper-plated aluminum strands covered with the solid insulation layer. The cords are highly flexible fitting snugly into the grooves along the hood and other parts of the vehicle. Unlike other jumper cables having 8 gauge, these cords run for impressive 20 feet allowing considerable space between the savior vehicle and the stranded one. The cords convey constant 400 Amps. This charge is enough for getting the small-to-middle SUV’ motor to work. The clamps are as sturdy as the ones attached to the 4 gauge cables and ensure full connection through their all-covering design. These long jumper cables are made tangle-free and weather-resistant in order to ensure efficient performance at any conditions. Until the moment, the cables can be stored in a special complementary transparent plastic bag taking very little space in the car’s trunk. Different color coding defines the polarity of the cables and clamps securing the user from mistakes. Heavy duty solid spring provides for wide jaw opening without effort. Low price and solid warranty. Unsteady connection of the cable to the clamp — might be pulled off at the frequent use. A long work at the maximum current might cause smoking. Most of the beginner drivers don’t know how to use jumper cables on a car. Meanwhile, the incorrect placement of the clamps or even the order of hook-up can cause various issues from harmless sparks to the serious damage to the car’s electronic system or a battery blow-up. The following scheme shows how to use jumper cables and crank your engine safely. Check the voltage. The battery of the jumping vehicle must have at least equal voltage to the battery needing assistance. Align the vehicles.Try to get the cars as close as possible. The longer the cord, the more distance is allowed for. Immobilize both vehicles. Check that both cars are neutral and the handbrake is on (or in “parking” for automatic transmissions). On a slope, applying the wheel jambs will additionally secure the car. Turn on the ignition and start the boosting motor. Let it work for a while. Another black clamp goes to negative (-) post of the flat battery. Start the engine of the stranded car. The engine must turn on. Leave both engines working for a while. Unhook the cables in the reverse order. Black from the metal part – black from the battery – red from the booster battery – red from the stranded bank. The jumper cables represent two copper or aluminum cords each having a clamp on each end of the wire. One cord is labeled positive (red), another – negative (black). Their task is to convey the current from one power bank to another until the engine of the stranded car gets turned on. Upon that, the alternator or a generator takes on the battery charge, and cables can be disconnected and folded into the storage bag. While jump starting, pay attention to the temperature of the cables and their insulation. Any scrape on the coating or warmth at the cables can cause a current shock or a short circuit. Check the cables before and during each usage. Copper wins. Full copper wire conveys more electricity within a moment than a copper-clad one and is less subject to heating up. Choose the gauge. Comparing 2 gauge vs. 4 gauge battery cable, consider the purpose of buying the cables. For light vehicles, the 4 gauge doesn’t take much space in the trunk. 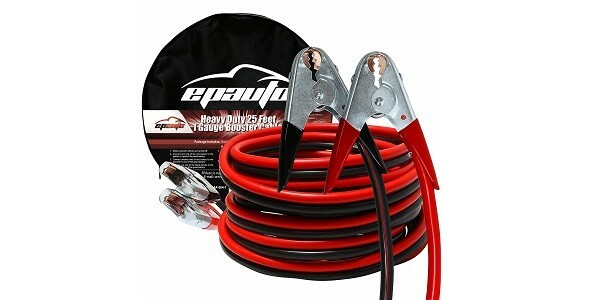 For constant SUV battery powering, 2 gauge is the best gauge for jumper cables, cranking the engine immediately. Get them long. The parking lots are usually jammed. Long cables will allow for different positioning of the cars. Have them safe. Consider the insulation thickness and the area it covers. Full coating over the clamps and wire is perfect. Clamps are important. Consider the massive tight-grip clamps with the rubber hands and widely-opening jaws – for the better connection to the battery. Are they flexible? The bending cables resist the low temperature and fit into the storage pouch snugly.